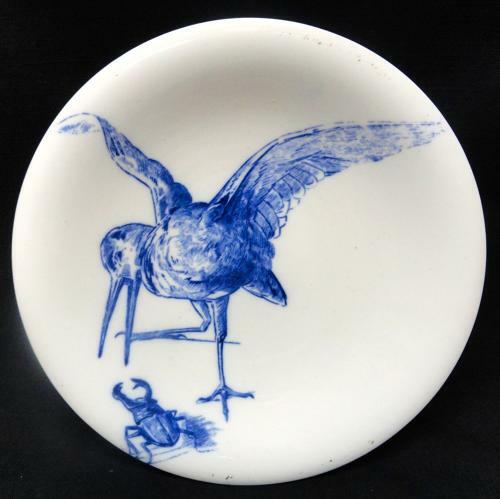 This early Victorian raised 9 3/4 “ wide x 2 1/4 “ tall raised tazza is transfer printed in blue. Designed by Pierre Mallet. This delightful comport combine the new Aesthetic and Japanese influences of the late 19th Century, with a freer more naturalistic design and the use of asymmetry, along with the English love of nature. This designs have French influences, and resemble work of some of the French designers, such as Bracquemond. The designer, Pierre Mallet, was French, but worked in England with Minton and other major English companies, in the 1870s. Great condition. Impressed Minton marks to base.